Signage Fascia Painting for Reeds Rains in Stoke-on-Trent. Reeds Rains are a large firm of Estate Agents and Letting Agents established in 1868. 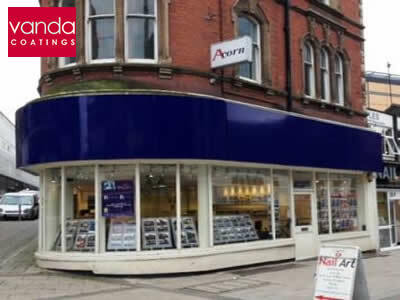 The company has an extensive network of branches throughout the UK and Vanda Coatings were asked to carry out signage fascia painting for the Reeds Rains outlet in Hanley, Stoke-on-Trent. The Reeds Rains signage consisted of logos which were on vinyl. This vinyl had been stuck on and wrapped around the whole fascia which spanned a width of 15-20 metres and was about 2 metres deep. The first stage of the project was to strip off all the vinyl using a heat lamp. Even after the vinyl had been removed our team found that the fascia surface was still sticky from the glue that had been used to attach it, so they used a special product to eliminate the residue. Since the fascia was high up off the ground, our Vanda team used a tower to reach the signage and they are PASMA trained accordingly. In fact, every one of our operatives has a PASMA certificate. All the work was carried out during trading hours and our team were thoughtful in making sure that there was as little disruption as possible to the business, so Reeds Rains could continue operating as normal. A solution to having to mask off the window without hiding it was to drop clear sheeting over the glass. This enabled customers to see into the estate agents and because it didn’t block out any light the staff were able to work in daylight as they would have normally. After the required areas were sheeted and masked off, the surface of the fascia was de-greased with a specialist de-greasing agent. It was then mechanically sanded down. This rubbing down generated some debris, so the surface was de-greased again before a few layers of top coat in dark blue were spray-applied. Finally, the plastic sheeting and masking tape was removed and the whole area tidied up. All in all our Vanda team took a day to strip the fascia back and another day for prepping followed by the signage fascia painting for Reeds Rains in Stoke-on-Trent. The resulting smart finish can be seen on the photos.